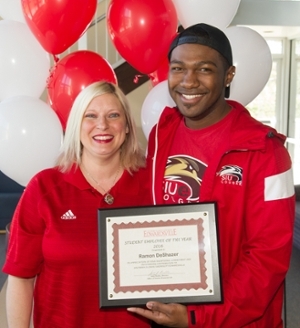 Southern Illinois University Edwardsville junior vocal performance major Ramon DeShazer, of Edwardsville, has been honored by the Office of Student Financial Aid as the 2016 Student Employee of the Year. The award recognizes DeShazer’s tremendous contributions and dedication to his position as mail clerk in University Housing’s Cougar Village. April 10-15 has been declared National Student Employee Week by the National Student Employment Association. As part of the celebratory week, DeShazer was surprised by his colleagues, mentors and managers on Tuesday, April 12 with the award, presented by Sally Mullen, director of the Office of Student Financial Aid. DeShazer is responsible for daily tasks in the mailroom and is a leader among his peers. Jennifer Hoxsey, chief clerk in University Housing’s Cougar Village, nominated him. Hoxsey praised DeShazer for his punctuality, leadership abilities and innovative contributions to maintain an efficient workflow. Along with his professional commitment, DeShazer excels academically and serves as president of the National Society of Leadership and Success. He was founder, director and president of the ENCORE Show Choir, has served as a Springboard leader and volunteered his time to enrich the lives of other SIUE students. As part of the award, DeShazer receives a plaque, a $75 gift card to the Cougar Store, an SIUE beach towel and bag, and cards for free Pepsi products in the Morris University Center. He is now entered in the Midwest competition through the Midwest Association of Student Employment Administrators, a branch of the National Student Employment Association. First runner-up for SIUE Student Employee of the Year was senior Chris Crabel, of Chillicothe. Crabel works in the Morris University Center Administrative Office. Senior Robert Crater, of St. Joseph, was second runner-up. Crater works in Library and Information Services. Photo: Jennifer Hoxsey helps Ramon DeShazer celebrate his recognition as Student Employee of the Year.